a blockchain platform based on Ethereum, the first in its kind automated service for car towing. 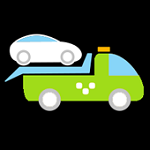 It brings together all tow trucks to one online network and provides for fast and safe transportation of vehicles at any time and from anywhere. You only have to download the mobile app. The project successfully launched in more than 20 cities. For crypto-investors this is a chance to be the tokenholder of an up and running project set for explosive increase of market share.